Negative reviews are often inevitable when running a business. And, with so many online platforms available, it’s never been easier to be publicly criticized. Yet, while positive reviews are amazingly useful for your brand image, negative ones can also be valuable. Seemingly bad reviews can actually help elevate your brand image if you use the right strategy in your replies. They give you an opportunity to use your brand voice and right your wrongs out in the open. Whether they’re on Google, Facebook or Amazon, negative reviews are necessary to balance out your review average. Having 30 reviews and a 5/5 average can seem suspicious to potential buyers. Of course, you don’t want too many negative reviews, either. According to BrightLocal, 57% of consumers won’t use a business with fewer than four stars. When you receive a negative review, you should reply swiftly and strategically. Here’s why and how to respond to negative reviews and make the most out of an online critique, turning a negative into a positive. Why Respond to Negative Reviews? A bad review won’t simply disappear. And if you ignore it, that will likely make things worse. Remember that you’re not replying to just the one reviewer. Potential future customers are watching, and won’t choose to do business with companies with a bad reputation. Did you know that 86% of consumers read local businesses’ reviews? Plus, 89% of those read the businesses’ responses to reviews. That just goes to show your reviews and responses can have a big impact on people’s impressions of your business. In addition, replying shows other readers you are not shady or neglectful to feedback. It shows that you have taken steps to ensure a problem won’t happen to your future clients. Also, customers who receive a problem resolution are twice as likely to buy from you again. So set potential future customers’ minds at ease by addressing the issues in a negative review directly. First, explore the possible reasons why a reviewer has left a negative review. Check your past transactions with the reviewer and their experience with your business. Once you determine the real reason for the review, you can start crafting your reply. Respond quickly to show that your customer’s experience is your priority. Since it’s a public review, it should be treated as urgent. So, reply quickly to show that you’re in tune with customer feedback and that you actively take part in your business. In your response, it’s important to offer a solution. If it was your fault, be honest. However, don’t take responsibility for things that weren’t your fault. Explain what things you can and can’t do. For example, if harsh weather made you cancel an event, explain that in the future you’ll monitor the weather and attempt to provide potential cancellation warnings. Avoid cookie-cutter responses that don’t address any of the specific issues raised in the review. Be precise about the customer’s experience. Communicate any changes or improvements you have made or will make based on their feedback. That may please the reviewer, but other potential customers will also see how important client satisfaction is to you. To further address the issue, ask the customer to contact you by phone or email. Or take it one step further. Ask the customer to stop by your business so you can discuss the problem in person. A positive post-review interaction can change the reviewer’s mind, turning their bad review into a positive one. When responding to negative reviews, it’s extremely important to be respectful. Keep the response civil and aimed at your customer’s dissatisfaction, even if the review was unjustified. Additionally, don’t ever share personal data of the reviewer or attack them personally online (or in the real world.) Just as you would be face-to-face, always be polite and professional. Furthermore, always remember to say “thank you for your review” in your replies to negative reviews. You can also apologize when appropriate. Being empathetic with your customer’s complaint shows compassion, even when a review is unfounded. Even if the review is unfair, don’t go into too much detail or ask questions to prove your case. Long responses can legitimize the complaint and incite the customer to add more negativity in their review. Think of it this way: Your response is important to the individual who left the review, yet, it’s intended for the eyes of potential clients who will be reading it for weeks or months to come. So, don’t let your emotions cloud your judgement. For the best results, try to reply with three or four sentences. Furthermore, clients want to interact with people who act like humans, not a bot. Thus, try to be as authentic as possible in your replies. Avoid using marketing jargon and keep the conversation real and honest. Your reviewer will appreciate it and be more likely to create a rapport with you. Pro Tip: sign off your reply with your name or initials for a more personal touch. Though it’s important to touch all the points mentioned above, avoid using the same canned response over and over. Instead, customize your replies for each individual reviewer’s feedback while using the same strategy. To help “push down” the negative reviews, it’s important to get more positive reviews. The more, the better, but it’s good to have at least 10 reviews on each platform (Google My Business, Facebook, etc.). Research shows that most people typically only read up to 10 reviews before making a purchasing decision. 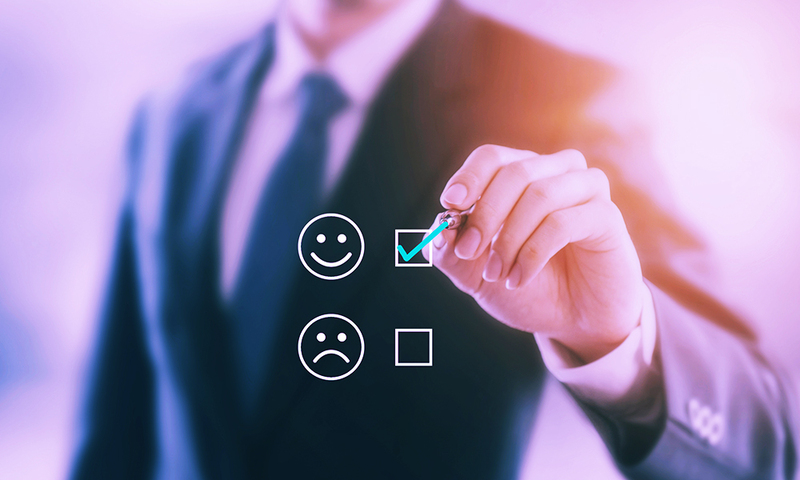 To get more positive online reviews, make it easy for happy customers to leave reviews. Use a tool, such as BrightReviews, to get more positive reviews and develop a trustworthy online presence. Don’t worry, asking for reviews is appropriate as long as you don’t entice clients with money, discounts, or other prizes. You should never ignore negative reviews. In fact, each one is an opportunity to produce good brand marketing. Replying to reviews – the right way – can help you improve the customer experience and assure potential clients that you care. Follow these tips and you’ll leave a positive impression with both current and future customers.